When you need a reliable removalist to help you get your belongings interstate from Darwin to Canberra, look no further than Transcorp Removals & Storage. Our professionals boast years of experience helping people right across Australia relocate successfully and without stress. Offering highly competitive prices and additional services such as backloading to help you cut costs, there’s no better choice when you need trusted interstate removalists. When you choose our team to help you make the Move interstate from Darwin to Canberra, you can trust that we’ll treat your belongings with the utmost care. We understand the importance of careful handling and strive to get all items to their destination in the same condition in which they left. We also have a fleet of fully equipped trucks and possess the necessary equipment to safely load and unload your furniture and other items. Interstate Removals from Darwin to Canberra – How Long Does It Take? If you’re moving interstate from Darwin to Canberra and require more information about our services, or if you’re ready to make a booking, call Transcorp Removals & Storage today on 1300 466 838. You can also request a free quote using our convenient online form. 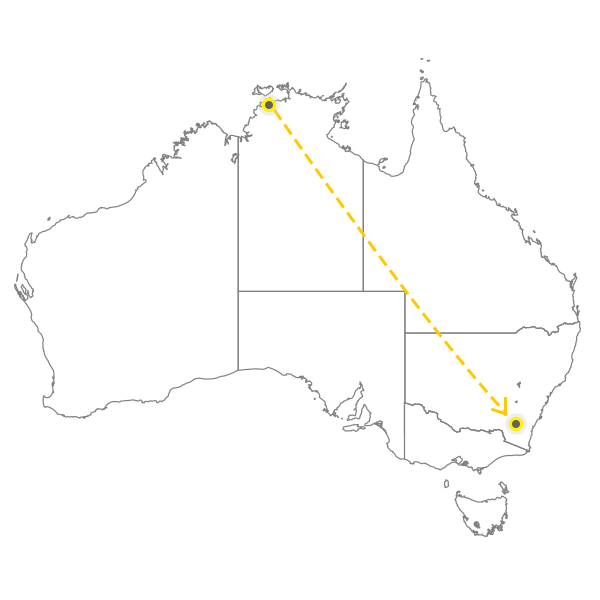 The approximate travel time from Darwin to Canberra (either way) is 14 to 28 business days. Please let us know if you need storage. We can also provide removalist services to all other areas that are located between Darwin and Canberra. Get in touch with us to obtain more information.